What a difference a week makes! Last week I compiled a list of the Best Books by African Writers in 2014 from the different lists out there, and since then there have been even more Best of Lists. Helen Oyeyemi and Dinaw Mengestu are in one of the lists, but the ones I've come across this week also have some really cool additions to the Best of Lists. 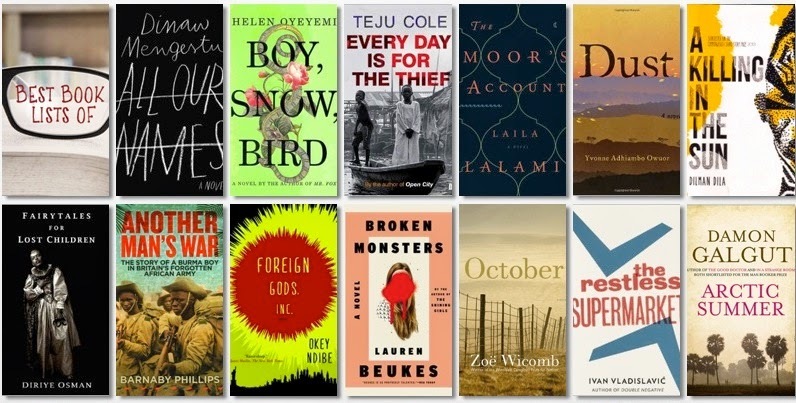 Starting with The Root, they compiled a list of the 15 best works of fiction by Black authors in 2014, which included Dinaw Mengestu's All Our Names, Nuruddin Farah's Hiding in Plain Sight, Okey Ndibe's Foreign God's, Inc., Teju Cole's Every Day is for the Thief, Helen Oyeyemi's Boy, Snow, Bird, Chris Abani's The Secret History of Las Vegas, Ishamel Beah's Radiance of Tomorrow, Bridgett M. Davis' Into the Go-Slow (yes, I'm claiming that one) and Nadifa Mohamed's The Orchards of Lost Soul. Over at Tor.com, their Reviewers' Choice: Best Book of 2014 includes Deji Olukoton's Nigerians in Space, Lauren Beukes' Broken Monsters, Nnedi Okorafor's Lagoon and Sarah Lotz's The Three. While at Kirkus, Nnedi Okorafor's Lagoon also makes it onto the Top 10 Alien Books of 2014. In South Africa, BooksLive showcases the list of all lists - Sunday Times Book Reviewers 2014 books of the year. I counted about 20 (mostly South African) books in a list of about 46 books - pretty awesome right? I also only really focused on fiction (so definitely check out the full list), although there are a few non-fiction books here. This list is insane and has crime, thriller, speculative fiction, YA and more. On the list we have Fiona Leonard's The Chicken Thief, Sarah Lotz's The Three, Alex Smith's Devilskein & Dearlove, Yvonne Adhiambo Owuor's Dust, Edyth Bulbring's The Mark, Thando Mgqolozana's Unimportance, Masande Ntshanga's The Reactive, Vernon RL Head's The Search for the Rarest Bird in the World, Dominique Botha's False River, Nadia Davids' An Imperfect Blessing, Karin Brynard's Weeping Waters, Lyndall Gordon's Divided Lives, Damon Galgut’s Arctic Summer, Imraan Coovadia's Tales of the Metric System, Rosamund Haden's Love Tastes Like Strawberries, Joanne Macgregor's Dark Whispers, Kirsten Miller's Sister Moon, Mark Gevisser's Lost and Found in Johannesburg (UK title is Dispatcher: Lost and Found in Johannesburg), Jaco van Schalkwyk's The Alibi Club and Lauren Beukes’ Broken Monsters. ... and became 35 (at my last count). With less than 3 weeks to go until the end of the year, I'm not sure what surprises will crop up in anymore Best of Lists, but let's wait and see.